Pernell-Karl Sylvester "P. K." Subban MSC (born May 13, 1989) is a Canadian professional ice hockey defenceman for the Nashville Predators of the National Hockey League (NHL). Subban was drafted by the Montreal Canadiens in the second round, 43rd overall, of the 2007 NHL Entry Draft. In 2013, he won the Norris Trophy as the NHL's top defenceman, and tied with Kris Letang as the leading scorer among defencemen. In the summer of 2014 he signed an eight-year, $72 million contract with the Canadiens, running through the 2021–22 season. After the 2015–16 season, Subban was dealt to Nashville in a highly publicized trade in exchange for Shea Weber. Pernell-Karl Sylvester "P. K." Subban MSC (born May 13, 1989) is a Canadian professional ice hockey defenceman for the Nashville Predators of the National Hockey League (NHL). Subban was drafted by the Montreal Canadiens in the second round, 43rd overall, of the 2007 NHL Entry Draft. In 2013, he won the Norris Trophy as the NHL's top defenceman, and tied with Kris Letang as the leading scorer among defencemen. In the summer of 2014 he signed an eight-year, $72 million contract with the Canadiens, running through the 2021–22 season. After the 2015–16 season, Subban was dealt to Nashville in a highly publicized trade in exchange for Shea Weber. Subban spent his junior career with the Belleville Bulls of the Ontario Hockey League (OHL). In 2005–06, he recorded 12 points in a 52-game rookie campaign. In 2006–07, he improved to 56 points in 68 games, where he was later drafted by the Canadiens in the off-season at the 2007 NHL Entry Draft. Subban then recorded 46 points in just 58 games during the 2007–08 campaign, before adding 23 points and matching his regular season goals total of eight in the post-season. He helped Belleville to the J. Ross Robertson Cup Finals against the Kitchener Rangers, where they lost the OHL title in seven games. Subban finished his four-year junior career with 76 points in 56 games in the 2008–09 regular season, with the Bulls advancing to the league playoffs, losing in the OHL semi-finals. Subban at the 2010 AHL All-Star Game. He began the 2009–10 season with the AHL's Hamilton Bulldogs. In May 2009, two weeks after his last junior game, Subban was signed to a three-year, entry-level contract by the Canadiens. He began the 2009–10 season with the Hamilton Bulldogs, Montreal's American Hockey League (AHL) affiliate. Later in the season, he was then selected to play in the 2010 AHL All-Star Game in Portland. Shortly thereafter, he earned his first call-up to the Canadiens on February 11, 2010, and, on the following day, registered his first career NHL point, an assist, in his debut against the Philadelphia Flyers on February 12. On April 26, 2010, Subban was recalled from Hamilton during the Canadiens' first round Stanley Cup playoff series against the Washington Capitals. He recorded his first NHL playoff point, an assist, in his first career NHL playoff game, on April 26. His first goal came in Game 1 of the Canadiens' second round series against the Pittsburgh Penguins on April 30, 2010. In Game 3 against the Philadelphia Flyers in the 2010 Eastern Conference Finals, Subban became the third rookie defenceman in Canadiens history to register three assists in one game. In all, Subban recorded one goal and eight points in 14 playoff games for the Canadiens, who ultimately fell to Philadelphia. After the Canadiens were eliminated by the Flyers, Subban was returned to the Bulldogs, who were still in contention in the Calder Cup playoffs. At the end of the AHL season, Subban was awarded the AHL President's Award in recognition of his accomplishments for the year. On March 20, 2011, Subban became the first Canadiens rookie defenceman to score a hat-trick in a game, which came in an 8–1 victory over the Minnesota Wild. Subban with the Montreal Canadiens during the 2011–12 season. Playing in 81 games in the 2011–12 season, Subban recorded seven goals and 29 assists. 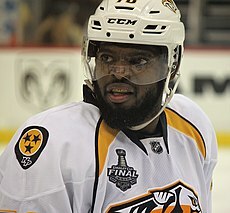 A restricted free agent after the season, Subban sat out the first four games of the 2012–13 season, which was postponed until January 2013 due to a labour lock-out, while the two sides negotiated a contract. On January 28, 2013, however, Subban eventually signed a two-year, $5.75 million deal with Montreal. He scored 11 goals and 27 assists, matching his career-high 38 points despite playing in only 42 games due to the lock-out. At the end of the season, he was awarded with the James Norris Memorial Trophy as the NHL's defenceman of the year, edging-out Kris Letang and Ryan Suter for the honour. On July 3, 2013, Subban was named to the NHL First All-Star Team. Subban then played all 82 games during the 2013–14 regular season, in which he registered a total of 53 points, ten of which were goals. During the 2014 playoffs, he was one of Montreal's most important assets, registering 14 points in 17 games as the Canadiens ultimately reached the Eastern Conference Finals, falling to the New York Rangers. Subban became a restricted free agent at the close of the 2013–14 season when his contract expired. According to the NHL Collective Bargaining Agreement (CBA), Subban earned the right to salary arbitration, having signed his first Standard Player Contract between the ages of 18 and 20 and having accrued four years of professional experience or more. He subsequently filed for arbitration before the deadline of July 5. The hearing took place on August 1, 2014, with Subban's camp asking for a one-year deal worth $8.5 million, while the Canadiens offered a one-year deal worth $5.5 million. Subban with the Canadiens during the 2014–15 season. Subban signed an eight-year extension with the Canadiens the summer prior to the start of the season. Under NHL CBA rules, the parties could continue to negotiate and reach an agreement until the arbitrator announced her decision, given in the 48 hours following the hearing. As arbitration was player-elected, once the arbitrator released her decision, the team would have had 48 hours to agree to the terms or walk away from the player, thereby making Subban an unrestricted free agent. The day after the hearing, on August 2, it was announced that Subban and the Habs had agreed to terms on an eight-year, $72 million contract, running through the 2021–22 season. The contract made him the highest-paid defenceman in the NHL and third-highest-paid League player overall at the time. It included a no-trade clause that would take effect July 1, 2016. On September 15, 2014, Subban was named an alternate captain of the Canadiens along with Max Pacioretty, Tomáš Plekanec, and Andrei Markov as Montreal head coach Michel Therrien elected not to award a captaincy following Brian Gionta's departure in off-season. On June 29, 2016, Subban, in a blockbuster move was traded to the Nashville Predators in exchange for defenceman Shea Weber. In his first season with the club, Subban recorded 10 goals and 40 points in 66 games. The Predators qualified for the 2017 Stanley Cup playoffs in the final wild card spot in the Western Conference. The team advanced to the 2017 Stanley Cup Finals against the Pittsburgh Penguins, but fell in six games. Subban finished the postseason with 12 points in 22 games. On May 2, 2018, Subban was named one of three finalists for the King Clancy Memorial Trophy as a player who best exemplifies leadership qualities and gives back to his community. The award eventually went to Daniel and Henrik Sedin. Subban was selected to play for Canada at the 2008 World Junior Ice Hockey Championships in the Czech Republic. He saw limited ice time as Canada's seventh defenceman, but was able to help the team capture their fourth consecutive gold medal at the tournament, defeating Sweden in overtime in the final. Subban again represented Canada at the 2009 World Juniors in Ottawa, taking on a more central role with the team. He scored three goals and nine points and a differential of +12 in the tournament, helping Canada to its fifth consecutive gold medal as they once again defeated Sweden in the final. Subban was named to the Tournament All-Star Team, along with Cody Hodgson and tournament MVP John Tavares. Subban was invited to participate in the 2012 IIHF World Championship, but was injured during pre-tournament play. In the next season, Subban was a late addition to the Canadian team at the 2013 edition of the tournament; he joined them in the elimination round for one game, which Canada lost. On January 7, 2014, Subban was named to Canada's 2014 Winter Olympic team for participation in the Games in Sochi in defence of their 2010 gold medal. They won gold, prevailing 3–0 over Sweden in the tournament final. Subban's parents both immigrated to Ontario from the Caribbean in the 1970s. His father, Karl, moved from Jamaica to Sudbury, and his mother, Maria, came from Montserrat to Hamilton. Karl is a retired school principal. Subban was born in Toronto and raised in the city's Rexdale neighbourhood. He has four siblings: Nastassia, Natasha, Jordan and Malcolm. Malcolm is a goaltender who was selected by the Boston Bruins in the first round of the 2012 NHL Entry Draft, and currently plays for the Vegas Golden Knights. Malcolm and P.K. faced each other for the first time in a December 8, 2017 game on the elder Subban's home ice. Malcolm, starting in net for the injured Marc-Andre Fleury, earned the win. Jordan was drafted by the Vancouver Canucks in the fourth round of the 2013 NHL Entry Draft. P. K., Malcolm, and Jordan all played for the Belleville Bulls during their junior career. Growing up, Subban was good friends with Toronto Maple Leafs' player John Tavares. He also played and won a Triple-A Novice title with Tampa Bay Lightning captain and star Steven Stamkos. Although he was raised in Toronto, Subban did not grow up as a fan of the hometown Toronto Maple Leafs. He revealed on the Montreal talk show Tout le monde en parle that he always wanted to play for Montreal ever since he was a kid. He also said that Canadiens' legend Jean Béliveau was one of his biggest idols growing up as a hockey player. During the 2018 NHL Awards, Subban was revealed as the cover athlete for the NHL 19 video game. As of June 2018, he is in a relationship with American skier Lindsey Vonn. In addition to the RW-CO deal, Subban's marketing company, P.K.S.S., has landed him several business partnerships including ones with Bridgestone, Gatorade and Air Canada. A lot of things are said about me. And maybe if I didn't play in Montreal to start my career, a lot of those things would not have made news. But when you're in Montreal, everything gets kind of blown up and everything becomes news, which is fine. None of that stuff ever really bothered me. I'm not that self-absorbed where I think everybody on the planet is going to love me or love everything about me. They're all not going to love the way I play the game or think I'm the best-looking guy in the world. It's just not going to happen. You're going to have people disagree. They may not think how I play the game is the right way. Or they may not think everything I do is truly authentic and real, but that's just life. What are you going to do? All you do is continue to work on yourself every day as a player and as a person, and that's it. I try to get better every day and continue to do good things, not just for myself, but for the people around me, and just create good energy around me wherever I go, because that's the only way to live, in my opinion. Off the ice, Subban has a well-known, stylish sense of fashion. He often is seen in designer suits and unique accessories. That appreciation of style has been parlayed into being the spokesman for a RW-CO line of suits. Before the 2015–16 season, on September 16, 2015, Subban announced a commitment to raise $10 million for the Montreal Children's Hospital by 2022. The hospital called it "the biggest philanthropic commitment by a sports figure in Canadian history". After his donation, Subban continued his commitment as spokesman and organized the Winter Wonderland with Air Canada at the hospital before the holidays. In 2017, he was awarded the Meritorious Service Cross (Civil Division) in recognition of how his "generous gift stands as an example of how professional athletes can positively change lives in their communities". He was also added to the "Google.org Impact Challenge" judge panel in Canada, to help choose which organizations should receive money to help Canada. Since his trade to Nashville, Subban has continued his philanthropic ways. His latest organization, P. K.'s Blue Line Buddies, focuses on building better relations between law enforcement and inner-city youths. According to a 2017 Tennessean article, an officer, a youth and their guests are treated to a Predators home game with perks like autographs and dinner in Bridgestone Arena's Patron Platinum Club. Subban with Team Canada during a exhibition game against Switzerland in 2012. 1 2 "Governor General to Present Honours in Montréal". February 27, 2017. ↑ "Canadiens sign defencemen Subban, Benoit to contracts". TSN. May 14, 2009. Archived from the original on June 1, 2009. Retrieved May 14, 2009. ↑ "Subban's callup adds extra drama ahead of Game 6". CBC Sports. April 26, 2010. Archived from the original on April 29, 2010. Retrieved December 14, 2010. ↑ Dave Stubbs (April 27, 2010). "Subban solid in playoff debut with Canadiens". National Post. Retrieved December 14, 2010. ↑ Doug Harrison (April 30, 2010). "Penguins' power play ices Habs". CBC Sports. Retrieved December 14, 2010. ↑ Tim Wharnsby (May 20, 2010). "Canadiens dominate Flyers in Game 3". CBC Sports. Retrieved December 14, 2010. ↑ "Springtime hockey continues for Subban". Sportsnet. May 25, 2010. Archived from the original on July 27, 2010. Retrieved December 14, 2010. ↑ "Habs prospect Subban wins AHL honours". Toronto Sun. July 8, 2010. Retrieved December 14, 2010. ↑ Stéphane Laberge (March 26, 2011). "P. K. Subban écrit l'histoire". RDS (in French). Retrieved March 28, 2011. ↑ "Canadiens sign Subban to two-year, $5.75M contract". TSN. January 28, 2013. Retrieved June 12, 2013. ↑ "NHL Awards: Capitals star Alex Ovechkin wins Hart Trophy as league's MVP". Winnipeg Free Press. Retrieved June 17, 2013. 1 2 "NHL Collective Bargaining Agreement" (PDF). National Hockey League. Retrieved September 17, 2014. ↑ Ken Campbell (July 5, 2014). "Great news for Canadiens fans: P.K. Subban files for arbitration". The Hockey News. Retrieved September 17, 2014. ↑ Sean Fitz-Gerald (August 1, 2014). "A rundown of Montreal Canadiens defenceman P.K. Subban's arbitration hearing and what comes next". National Post. Retrieved September 17, 2014. ↑ "Canadiens agree to terms on an 8-year contract with defenseman P.K. Subban". Montreal Canadiens. Retrieved August 2, 2014. ↑ Arpon Basu (August 3, 2014). "Subban, Canadiens agree to terms on 8-year contract". National Hockey League. Retrieved September 17, 2014. ↑ "Canadiens opt for four alternate captains this season". National Hockey League. September 15, 2014. Retrieved September 15, 2014. ↑ Allen, Kevin (June 29, 2016). "Canadiens trade P.K. Subban to Predators for Shea Weber". USA Today. Retrieved June 29, 2016. ↑ "King Clancy Trophy finalists unveiled". National Hockey League. May 2, 2018. Retrieved May 3, 2018. ↑ "Daniel, Henrik Sedin of Canucks win King Clancy Trophy". National Hockey League. June 20, 2018. Retrieved June 25, 2018. ↑ "Canadian National Junior Team Roster Announced". chl.ca. December 14, 2008. Retrieved February 12, 2019. ↑ Kimelman, Adam (December 16, 2009). "Canada names final WJC roster". NHL.com. Retrieved February 12, 2019. ↑ "CANADA'S NATIONAL JUNIOR TEAM CAPTURES GOLD MEDAL AT 2009 IIHF WORLD JUNIOR CHAMPIONSHIP". hockeycanada.ca. January 5, 2009. Retrieved February 12, 2019. ↑ "P.K. Subban injury highlights risk of playing at world championship". National Post. May 1, 2012. Retrieved February 12, 2019. ↑ "Subban joins Canada". IIHF.com. May 13, 2013. Retrieved February 12, 2019. ↑ "PK Subban, Carey Price will play for Team Canada in Sochi". CTV News. January 7, 2014. Retrieved January 7, 2014. ↑ Coyle, Jim (October 12, 2015). "The making of P.K. Subban's big-league heart". Toronto Star. Retrieved February 7, 2018. ↑ "Subban family, Claireville school community gather for principal's retirement". Etobicoke Guardian. June 25, 2013. Retrieved June 30, 2013. ↑ "Can this family produce three NHL stars? The unlikely rise of Team Subban". Toronto Life. December 11, 2013. Retrieved May 29, 2017. ↑ "P.K. Subban's NHL dream". Toronto Star. December 24, 2007. Retrieved April 6, 2011. ↑ "Golden Knights claim goaltender Malcolm Subban off waivers from Bruins". sportsnet.ca. October 3, 2017. Retrieved February 7, 2018. ↑ Schoen, David (December 8, 2017). "Golden Knights goaltender Malcolm Subban faces older brother for first time". Las Vegas Review-Journal. Nashville, Tenn. Retrieved February 7, 2018. ↑ "Canucks make Jordan Subban fourth round selection". Belleville Bulls. June 30, 2013. Retrieved June 30, 2013. ↑ Gordon, Sean (August 23, 2012). "Subban, Tavares set friendship aside, just for a night". The Globe and Mail. Retrieved October 15, 2013. ↑ Fitz-Gerald, Sean (May 1, 2016). "Old photo evokes thousand hockey memories". Toronto Star. ISSN 0319-0781. Retrieved January 12, 2018. ↑ "Subban of Predators to be on cover of EA Sports NHL19". National Hockey League. Retrieved June 20, 2018. ↑ Dampf, Andrew; Walker, Teresa M. (February 8, 2019). "Vonn and boyfriend Subban go together like snow and ice". Associated Press. Retrieved February 11, 2019. 1 2 Chuck Gormley (November 21, 2017). "P.K. Subban: There's a time and a place when it needs to be all about hockey". ESPN. Retrieved January 12, 2018. ↑ Gormley, Chuck (November 21, 2017). "P.K. Subban: There's a time and a place when it needs to be all about hockey". ESPN. ↑ "Men's Suits featuring PK Subban". rw-co.com. Retrieved January 12, 2018. ↑ Mio, Kevin (September 17, 2015). "P. K. Subban's foundation pledges $10 million to Montreal Children's Hospital". The Gazette. Montreal. Retrieved December 8, 2017. ↑ Fox, Luke (September 16, 2015). "P.K. Subban making $10 million donation in Montreal". Sportsnet. Retrieved December 24, 2015. ↑ "P. K. Subban unveils Winter Wonderland at Montreal Children's Hospital". CBC News. December 24, 2015. Retrieved December 24, 2015. ↑ "Google.org Impact Challenge | Canada". Google.org Impact Challenge | Canada. Retrieved March 31, 2017. ↑ "P.K. Subban's latest target – the barrier between police, kids". The Tennessean. Retrieved January 12, 2018. Wikimedia Commons has media related to P. K. Subban.